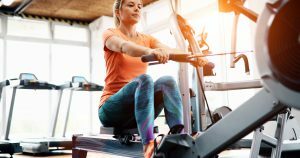 Jumping on a rower and getting a great workout seems easy enough, but it’s a good idea to learn how to use a rowing machine properly first to ensure you don’t hurt yourself. Rowing machines offer great cardiovascular and strengthening exercise, but if done incorrectly, you can easily strain muscles in your back, shoulders, and hips. I’m here to make sure you get the most out of your rowing experience without causing any unneccesary discomfort. Let’s talk a little anatomy first, it’s always good to know what you are exercising when you exercise. Rowing is fairly unique in the fact that it offers a total body workout. Most cardio machines do not. Think about it. Treadmills are awesome, but they only target your legs. Ellipticals, stationary bikes (unless you are using a fan bike), stair masters- all legs. Some ellipticals let you push and pull a little with your arms, but who ever felt sore in their arms after using an elliptical? Rowing offers a great combination of upper body, lower body, and core involvement during one fairly simple move. The good news is, the more muscles you use during exercise, the more calories you burn. Anytime we can burn more calories, it’s a good thing. Rowing is great at burning calories, in fact, it’s been estimated that a 185 lb person burns about 10 calories/min rowing at a moderate pace (see resource here). And guys, these are just the big muscles. 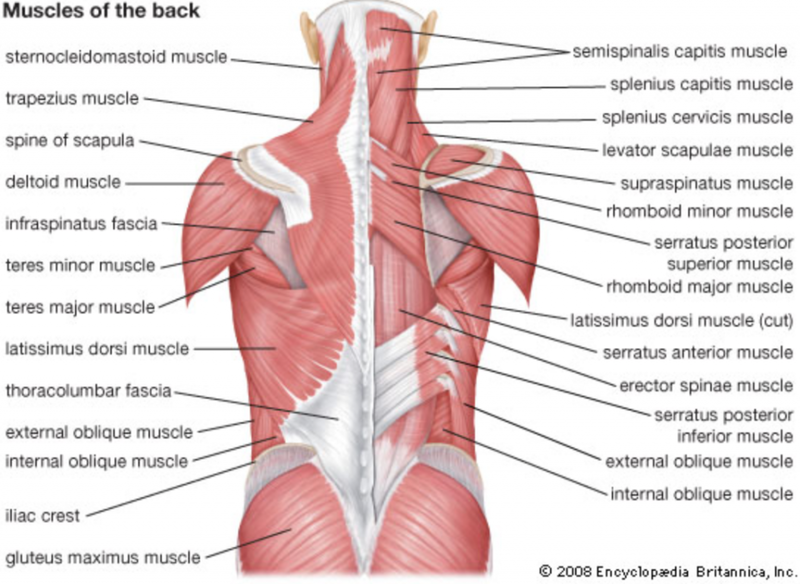 Think about all the other smaller, postural muscles in our neck and spine that weren’t mentioned. The point is, rowing almost literally works every muscle in your body at the same time. As you can see from the rough list above, every major muscle group in the arms, legs, and back was listed. Working all these muscles, with one exercise, for any given time limit is going to get your heart rate up. Sustaining this is going to give you one heck of a cardiovascular workout. This is the main reason people row, for the cardiovascular benefit. But rowing can also really improve total body strength. Especially if you do intervals or short bouts of intense pulling. With time, this will significantly increase your back and leg strength. Having a stronger back and legs makes you more durable in the real world and less likely to injure self during real world activities- lifting, pushing, pulling, etc. Another great benefit of using a rowing machine is the fact that rowing is a very low-impact exercise (if done correctly). With a nice rowing machine, the seat glides smoothly and the pull is nice and fluid- this all equates to minimal stress through your joints. The more comfortable your exercise is, the more likely you are to continue exercise regularly. You have to be careful with your back and knees. Flexing your back too far or hyperextending your knees will not feel good. But if done with correct form, rowing can offer a very comfortable form of exercise for your entire body. Additionally, for those of you who like to workout at home, rowing machines have become increasingly popular for home use. Many are light weight and portable. For a full length rowing machine, you only need an area of about 8’x2′ to use comfortably. Surprisingly, rowers are also some of the most affordable exercise machines around. Especially when compared to treadmills and high end spin bikes. For example, the most popular rowing machine on the planet costs about half the price of a nice treadmill. 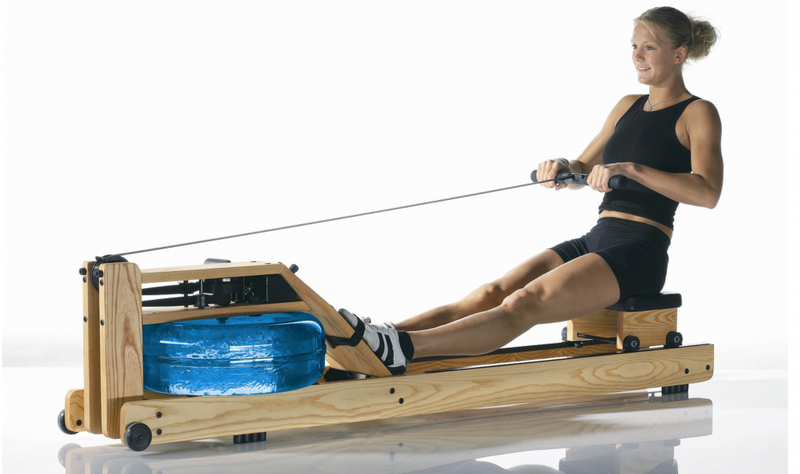 If you would like to learn more about the best rowing machines available, click here. We know rowing is great because of the total body workout, but we need to make sure we are doing it safely. With all of the muscles being worked, it can be easy to strain one or more of them while rowing. The most common injury while rowing is a low back strain (pulled muscle). This makes sense due to all of the work the low back is doing during this exercise. Other common injuries include knee pain, neck strains, and wrist problems. Bend knees and lean forward to reach handle, grip lightly. I know, words are ok, but a picture is worth a thousand words. Luckily, there is an awesome video tutorial on youtube, check it out here to make sure you this makes sense. Gradually increase your workout time- like any other exercise, you need to gradually build yourself up for longer workouts. Start at 5-10 min and gradually work up to 30 min when you know your body can handle it. You could try adding 5 min a week. Don’t hit the seat into your feet, it doesn’t feel good and it’s no good for your knees! That about does it. Now you know how to use a rowing machine properly. Regardless if you have your own rower in your home or if you are rowing at the local gym, I’m sure you will be doing it correctly now. You may even find yourself critiquing others. If you see someone doing it incorrectly, you may want to give them a helpful tip. I hope you found this information helpful. If you have any questions, leave a comment and I’ll get right back to ya. Happy rowing!